The present invention is directed to hemostatic wound dressings that include a substrate for contacting and/or covering a wound, where the substrate includes a wound-contacting surface, and which substrate contains or is fabricated at least in part from a biocompatible, aldehyde-modified polysaccharide, preferably biodegradable polysaccharides and to methods of providing hemostasis to a wound, which method includes applying to a wound requiring hemostasis the hemostatic wound dressing of the present invention. To date, aldehyde-modified cellulose has not been utilized in wound dressings to provide hemostasis. Methods of producing highly oxidized tri-carboxylic acid derivatives of cellulose as hemostic materials, involving two-stage oxidation by successive processing with an iodine-containing compound and nitrogen oxides, has been disclosed in RU2146264 and IN159322. As disclosed in these disclosures, oxidized cellulosic materials were prepared by preliminary oxidation with metaperiodate or periodic acid to yield periodate-oxidized, dialdehyde cellulose to form the intermediate for forming OC. The dialdehyde cellulose intermediate then is further oxidized by NO 2 to yield the OC with a higher carboxylic acid content, which is suitable for use as a hemostatic, anti-microbial and wound healing agent. The disclosures do not, however, suggest or disclose that the periodate-oxidized, dialdehyde cellulose intermediate formed in the first stage oxidation may or should be used in the preparation of wound dressings, e.g. hemostatic wound dressings. The hemostatic dressings of the present invention also provide anti-microbial activities due to the presence of effective amounts of the aldehyde moieties. It has been shown that in spite of being non-acidic, the aldehyde-modified regenerated cellulose is anti-microbial in nature. The hemostats of the present invention were found to be significantly effective against microorganisms, such as Methicillin-resistant  Staphylococcus aureus (MRSA) and Pseudomonas aeruginosa, etc. The anti-microbial activities of the non-acidic aldehyde-modified regenerated cellulose are shown to be comparable to those of the acidic carboxylic oxidized regenerated cellulose conventionally used. 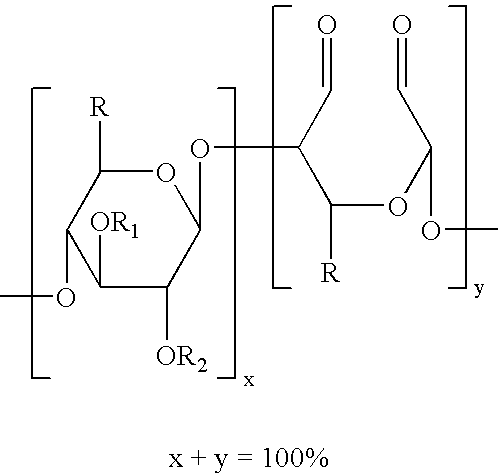 The acidic carboxylic oxidized regenerated cellulose loses its anti-microbial activities upon neutralization reaction or over a period of time as the acid groups are neutralized in the body. However, the aldehyde-modified regenerated cellulose utilized in the present invention is expected to retain its anti-microbial activity over a longer period of time. While the following examples demonstrate certain embodiments of the invention, they are not to be interpreted as limiting the scope of the invention, but rather as contributing to a complete description of the invention. Methicillin-resistant  Staphylococcus aureus (MRSA) organisms were grown in Trypticase Soy Broth (TSB) for 24 hours at 30-35° C. Trypticase Soy Agar (TSA) and TSB were the media used in this study. The dilutions used 0.85% saline. All media and solutions were sterile. a biocompatible, aldehyde-modified polysaccharide, wherein said wound dressing is hemostatic. 2. The wound dressing of claim 1 wherein said substrate comprises a fiber, a fabric, a sponge, a foam, a film, a bead, a gel, or combinations thereof. 3. The wound dressing of claim 1 wherein said aldehyde-modified polysaccharide is selected from the group consisting of aldehyde-modified cellulose, alkylcellulose, alkylhydroxyalkyl cellulose, hydroxyalkyl cellulose, cellulose sulfate, salts of carboxymethyl cellulose, carboxymethyl cellulose, carboxyethyl cellulose, chitin, carboxymethyl chitin, hyaluronic acid, salts of hyaluronic acid, alginate, alginic acid, propylene glycol alginate, glycogen, dextran, dextran sulfate, curdlan, pectin, pullulan, xanthan, chondroitin, chondroitin sulfates, carboxymethyl dextran, carboxymethyl chitosan, chitosan, heparin, heparin sulfate, heparan, heparan sulfate, dermatan sulfate, keratan sulfate, carrageenans, chitosan, starch, amylose, amylopectin, poly-N-glucosamine, polymannuronic acid, polyglucuronic acid, polyguluronic acid and derivatives of any of the above. 4. The wound dressing of claim 3 wherein said aldehyde-modified polysaccharide comprises an amount of aldehyde moieties effective to render the substrate biodegradable. 5. The wound dressing of claim 4 wherein said aldehyde-modified polysaccharide comprises regenerated cellulose. 6. The wound dressing of claim 5 wherein said substrate comprises a fabric. where x and y represent mole percent, x plus y equals 100 percent, x is from about 95 to about 5, y is from about 5 to about 95; and R is CH2OH, R1 and R2 are H.
8. The wound dressing of claim 7 wherein x is from about 80 to about 20 and y is from about 20 to about 80. 9. The wound dressing of claim 8 wherein x is from about 70 to about 30 and y is from about 30 to about 70. 10. The wound dressing of claim 8 wherein x is about 70 and y is about 30. 11. The wound dressing of claim 1 wherein said aldehyde-modified polysaccharide is essentially free of carboxylic acid moieties. 12. The wound dressing of claim 5 wherein said aldehyde-modified polysaccharide is essentially free of carboxylic acid moieties. 13. The wound dressing of claim 1 wherein said substrate consists essentially of said aldehyde-modified polysaccharide. 14. The wound dressing of claim 1 wherein said wound dressing provides hemostasis of a wound after application of said wound dressing to said wound. 15. The wound dressing of claim 1 consisting essentially of said substrate. a biocompatible, aldehyde-modified polysaccharide, whereby hemostasis is provided to said wound. 17. The method of claim 16 wherein said substrate comprises a fiber, a fabric, a sponge, a foam, a film, a bead, a gel, or combinations thereof. 18. The method of claim 16 wherein said aldehyde-modified polysaccharide is selected from the group consisting of aldehyde-modified cellulose, alkylcellulose, alkylhydroxyalkyl cellulose, hydroxyalkyl cellulose, cellulose sulfate, salts of carboxymethyl cellulose, carboxymethyl cellulose, carboxyethyl cellulose, chitin, carboxymethyl chitin, hyaluronic acid, salts of hyaluronic acid, alginate, alginic acid, propylene glycol alginate, glycogen, dextran, dextran sulfate, curdlan, pectin, pullulan, xanthan, chondroitin, chondroitin sulfates, carboxymethyl dextran, carboxymethyl chitosan, chitosan, heparin, heparin sulfate, heparan, heparan sulfate, dermatan sulfate, keratan sulfate, carrageenans, chitosan, starch, amylose, amylopectin, poly-N-glucosamine, polymannuronic acid, polyglucuronic acid, polyguluronic acid and derivatives of any of the above. 19. The method of claim 18 wherein said modified polysaccharide comprising an amount of aldehyde moieties effective to render the substrate biodegradable. 20. The method of claim 19 wherein said aldehyde-modified polysaccharide comprises aldehyde-modified regenerated cellulose. 21. The method of claim 20 wherein said substrate comprises a fabric. 23. The method of claim 20 wherein said aldehyde-modified regenerated cellulose is essentially free of carboxylic acid moieties.